“> 24 km from Batumi is the second largest Adjarian city of Kobuleti – one of the best Caucasian resorts famous for curative mineral waters. 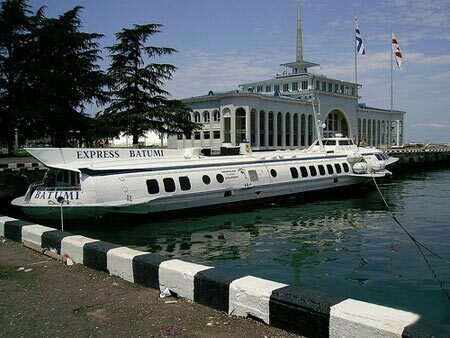 It is located along the Black Sea coast on the wide strip of sandy and fine-pebble beach. The resort’s climate is subtropical with lots of heat and humidity. Winters are mild without snow with average temperature in January +5 С; summers are sunny and warm with average temperature in July +28 С. Kobuleti is buried in thickets of tea and citron plantations, eucalypt and bamboo palm trees all year long. The mineral springs are two kilometers from the city. The healing waters of these springs are drunk to cure various diseases related to digestive organs, metabolism infringements, problems with liver, gallbladder, kidneys and urinary tracts. For hypertensive and gynecologic diseases, illnesses of bones and joints, nervous system and skin problems the mineral baths are very helpful. You will find everything you need for the high-quality vacation in Kobuleti. It is possible to sunbathe lying in chaise lounges on well-kept beaches, to experience various fun activities, rent a yacht, catamaran or scooter. The entire waterfront is occupied by cottages with cafes, bars, clubs and shops in front of them. Not far from them you will find the amusement park. In the evening Kobuleti turns into a noisy, cheerful resort city with active night life. There are a lot of fascinating excursions to the historical places of Georgia available – even visiting the neighboring Turkey.